Do you have a trial lesson? Yes, new students can join our school holiday program as their trial lesson, but we do not suggest new students to have their trial lesson during normal class times, as it causes distraction to our scheduled art program. My child is really interested in joining Clement Art School. Can I come and have a look at your class before I enrol? Yes, parents are welcome to come and visit our school during a specified ‘Enquiries Day’. Unfortunately we do not welcome parents during our class time. It may disturb our current student’s lesson and progress. What does my child need to prepare for each lesson? Teachers will provide & prepare some of the materials, such as papers, canvases, paints, and all the craft materials. Students need to prepare their own Derwent Watercolour pencils (36 colours) and Pental Oil Pastels (24 colours) to use in the class as well as an A3 size display folder to store their beautiful artworks. Student can also use their materials at home for school projects. Can I enrol on the first lesson? Sorry, we do not accept enrolments on the first lesson, Our teachers needs some time to prepare the class materials according to the number of the students in the class. The enrolment will need to be made 2 days before the first lesson. How many students per group? The best proportion is 6-8 students per group. If the classes have more than 8 students per group. We will arrange some students move to another class with less students. How do I know which level my child is? Is there an entry test? There is no entry test for our students. All our qualified teachers have very good teaching experience. They will divide students into different groups depending on their age and ability. If the student is absent caused by illness, will Clement Art arrange a supplementary lesson? Yes, we will arrange a supplementary lesson for the student (only for illness). 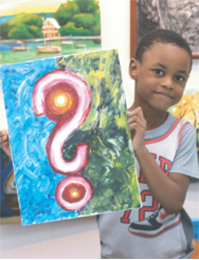 Does Clement Art have any discounts for the enrolment of two or more children? We have early bird booking discounts if you enrol our course 2 months before your first lesson starts. However, we do not have any family discounts or sibling discounts. I have two children, one is 12 years old and another one is 6 years old. Can they come at the same time and will they follow the same program? For your convenience, parents can bring their children at the same time even if they are at different levels. The teacher will sort them into the appropriate level for each child, they will not participate in the same program. Can you tell me how you will teach our child?